Compare our highly nutritious beefalo red meat to other meats and veggie burgers. Click here to see why you'll want to make beefalo meat your red meat choice for a lifetime. How we raise our USDA Certified Grass Fed Registered Beefalo using the highest standards without compromise to provide a superior quality, wholesome red meat in a class all its own. Quick reference regarding the beefalo breed and how our beefalo meat is distinguished above the rest. 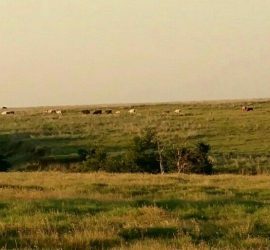 Crystal Prairie, L.L.C., is owned and operated by a husband and wife team who love living in Oklahoma and raising USDA Certified Grass Fed Beefalo in the heart of Oklahoma. Our sole purpose is to raise USDA Certified Grass Fed Registered Beefalo meat for local sale direct to your home. Our grass-fed bison infused beef (Beefalo) is one of the leanest red meats available that is lower in calories compared to beef or bison yet is high in Omega-3 fatty acids, protein, zinc, iron, B6, and B12. Our wholesome, nutritionally dense Beefalo meat is enjoyed in every cut available including premium steaks, ribs, roasts, and ground and is custom cut to each customer’s specifications. Crystal Prairie Grass Fed Beefalo beef combines the best of both worlds; bison quality nutrition with beef quality tenderness and marbling. Our Grass Fed Beefalo is superior in nutritional quality compared to beef and bison and has the same number of calories as AHA recommended heart healthy fish like salmon. Even a veggie burger has more calories than our Grass Fed Beefalo. 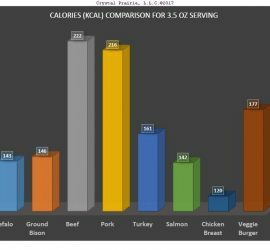 Beefalo meat offers a higher level of Omega-3 versus Omega-6 fatty acids and contains fewer calories compared to regular beef to such a degree that it is recognized by the USDA as a unique meat separate from beef under its own label: USDA Beefalo Beef. Our Beefalo are raised using sustainable and humane farming techniques to fulfill our mission to protect the environment, as well as, the welfare of our animals. While roaming on our open Oklahoma native grass prairie, our USDA Certified Grass Fed Registered Beefalo graze and thrive in a low-stress environment. 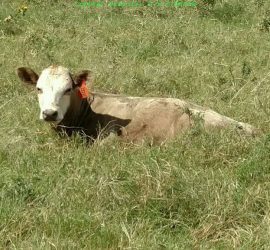 Our calves are born, weaned, and fed on our open prairie grassland and every animal receives individualized, high quality humane care throughout their lives. We allow our animals to grow at their natural rate, which tends to follow their bison ancestry, without the use of artificial growth stimulants, such as grain, grain by-products, artificial hormones, or antibiotics. Because of our Beefalo breed genetics and our independently verified USDA Grass Fed process, our animals need to grow on our pastures for up to 3 years versus up to 1.5 years for grain-fed beef. Because we do not compromise our standards for animal health and environmental sustainability, our Beefalo breed and USDA Certified Grass Fed practices produce a clean and highly nutritious red meat with incomparable flavor and tenderness completely free of grain and artificial growth stimulants in the way nature intended. Our friendly, local family-owned Oklahoma ranch is the ONLY farm to offer USDA Certified Grass Fed Beefalo in the state of Oklahoma. 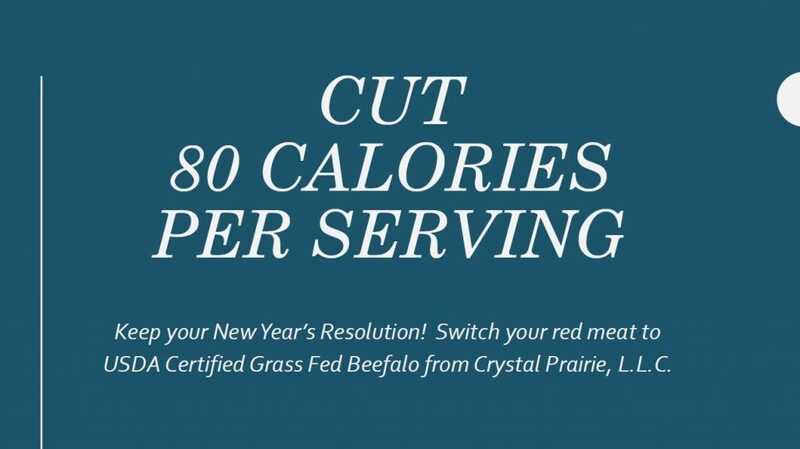 Filling your freezer with Beefalo beef from Crystal Prairie, L.L.C., lets you eat the red meat you want without the calories, cholesterol and fat you don’t want. With premium USDA Certified Grass Fed Registered Beefalo Beef from Crystal Prairie, L.L.C., you no longer have to decide between eating healthier or enjoying what you eat.